I’ve never had a bully hang me upside down and steal my lunch money. (757 people like this). 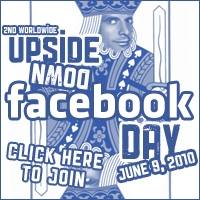 And then there’s also our own upside down status updates / sǝʇɐpdn snʇɐʇs uʍop ǝpısdn Facebook page. Stay tuned for our UDFD 2010 conclusion tomorrow! Posted by Pieter on June 10, 2010 at 4:15 AM. Use this trackback if you're linking this story.